You've probably heard about BB creams in the cosmetic world...but what about BB (beauty beverage) tea? When Elizabeth emailed me about this product I was like a hound on a scent. I had to know more. I believe in working beauty foods into a regular part of your diet: spinach, avocado, berries- you know the drill (and, shameless plug, if not download the beauty foods guide). Green tea, full of antioxidants and more hydration, is definitely one of those beauty boosters...so what does the dietitian think of Kusmi BB detox tea? When a product contains the claim 'detox' I'm incredibly skeptical. Detoxes are kind of frivolous to your body physiology and mostly a big market buzzword. Your body has personalized detox going on each and every day (kidneys, liver and more) and if you're doing what you should with your diet, you don't need it. But I get it- some people feel like they need a jumpstart and that's okay. 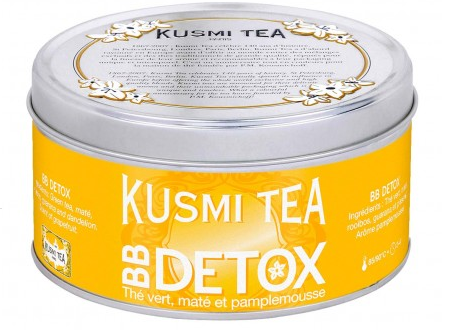 Kusmi is supporting keeping your body hydrated, especially with an antioxidant rich tea, is truly a detox aid. ecause the flavor and scent are so lovely, it helps those who just have a hard time wanting to drink water. That's something I can get behind. usmi BB Detox Tea has an intoxicating scent. I would wear it if I could. Sweet, not biting or acidic, the grapefruit main flavor draws anyone in the room closer to ask what you're drinking. Seriously. The husband walked through the living room and stopped short to ask where that aroma was coming from. The taste of the tea is light, not bitter like many teas can be. It's perfect plain and it's a sin to add anything more to it! And that's the idea. This beauty beverage works because it encourages hydration to a higher level than you would normally do. It's amazing iced or hot and it's just the kind of thing I would recommend to my clients in the evenings when they usually snack. The grapefruit also works in your favor since vitamin C is great for the skin. Bottom line: This product is pricey, but luxuriously delicious and quality. I will be recommending this to my wedding wellness brides from now on. That being said, above all, hydration is super important for beauty food nutrition! So if you're not up for adding this to your shopping cart, you still need to drink more and you can do it by adding fruit and herbs to your drink like I showed you here. Have you tried BB Detox Tea? Would you? Disclosure: This product was sent to me c/o Kusmi. I was not asked or compensated to write a review. Opinions are definitely my own.